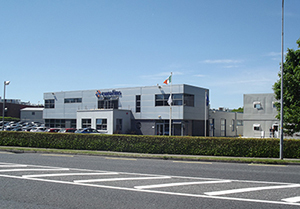 Eurofins BioPharma Product Testing's Ireland facility provides microbial, chemical and biologics analysis to the biopharmaceutical, biotech and medical device industries throughout the US, Europe and Japan. The company currently employs nearly 400 people based in Dungarvan and at client companies throughout Ireland and UK as part of the award-winning Professional Scientific Services® (PSS) programme. Microbiology and chemistry laboratories are fully equipped to offer complete testing services, including extensive chromatography facilities (HPLC, GC and LC-MS), spectroscopy (UV-VIS, AA and FTlR), metals analysis via AA, GFAA, dissolution testing, physical testing of tablets, full media preparation facilities, class A/B and C cleanrooms, isolator technology and MicroSEQ® genotypic bacterial and fungal identification and Bruker Maldi-TOF bacterial identification. Eurofins BioPharma Product Testing Ireland has broad experience using clients' methods and internationally recognised methods such as USP, BP or Ph. Eur. Alternatively, procedures can be developed in accordance with clients’ requests. All data and results can be accessed via the LabAccess Web portal.